Maximise your results with the right nutrition and exercise. MaxiNutrition Max is scientifically formulated to provide 20 g of sustained release protein. 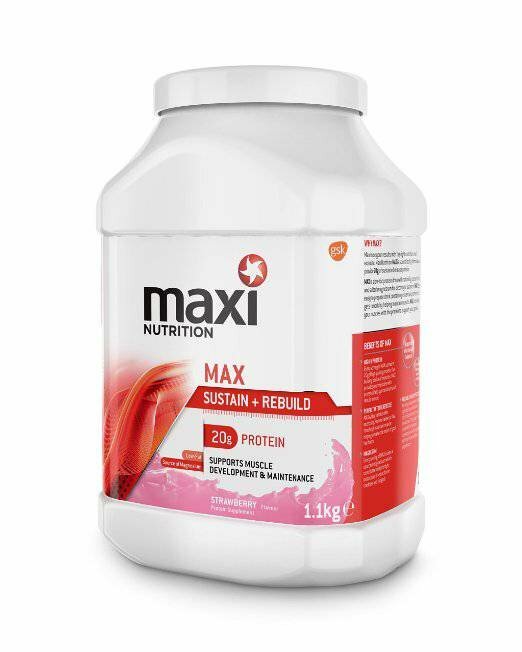 Max is a low-fat protein drink with naturally present salts and added magnesium for electrolyte balance. Max is an easy-to-prepare drink containing essential protein that gets to work by helping maintain muscle. Max provides your muscles with the protein to support your goals. High in Protein - every serving of Max contains 20 g of protein, the building blocks of muscles. Max provides your muscles with protein to help you maintain and rebuild muscle. Post Exercise - max is designed to be taken after exercising. Protein taken at this time helps maintain muscle - helping to make the most of your hard work. Magnesium - every serving of Max is also a source of magnesium which contributes to electrolyte balance and a reduction in tiredness and fatigue. Reliable and Effective - maxiNutrition uses proven, reliable ingredients with known scientific benefits in their products. Every batch of Max is screened for banned substances and is registered with the Informed-Sport programme. Effective, Healthy Nutrition - it takes hard work, determination, a whole lot of sweat and the right nutrition. MaxiNutrition works with leading athletes, nutritionists, scientists and physical trainers to deliver fine tasting proteins that work with you when you need them. Throughout the day muscle proteins are constantly being broken down and rebuilt, so they've formulated Max with proteins that will bring you a sustained release of amino acids to help maintain and rebuild muscle. They are passionate about performance nutrition. MaxiNutrition products are developed in partnership with the GSK human performance lab. The GSK HPL is an applied research and development centre working every day with elite athletes and explorers to deliver real improvements in human performance.